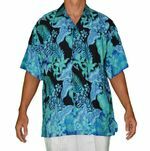 Men's Big, Large, Plus Size Hawaiian Shirts to size 6X. Shirts have been expertly sewn so the chest pocket matches up to the background. Some match up to the button line as well. There are no two shirts that are identical.